I’m not sure which is more disconcerting–that I spent 15 minutes outside today wearing only a cardigan and was comfortable doing it, or that I found an unusual number of signs of life in the garden. Just a reminder: It’s Minnesota and it’s January. Yet, today when I pulled aside some leaves I found this Salvia sending up several new shoots. 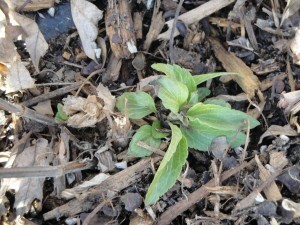 In the backyard, the Clara Curtis daisies I ripped out in October had sent up new leaves — green ones. And, in the vegetable bed, a few sprigs of parsley were growing. Now all of these plants are decidedly in the hardy category. I have found parsley under snow in spring before, but still, there are far more green things in my yard than is usual for January (when things are usually covered in snow). We’ll see what the rest of winter holds. But, so far, it’s just weird. the weirdness is operating in Massachusetts, too. Went out in a t-shirt today and wasn’t uncomfortable! I’m in northern michigan and can see most of the grass in my yard. I don’t dare look under the leaves i cover my plants with for fear of seeing new growth! What will this warm winter do the our flower gardens? Laura — I’m a bit worried about the gardens. A Master Gardener told me today that she has iris popping up in some of her beds (well covered by mulch, but still). Also seeing bulging buds on the shrubs. We go back into the deep freeze tomorrow, but it was 53 today. Yep, here in Ohio, too. Daffodils, daylilies, bearded iris and other assorted flowers are all sending up their leaf shoots. We’re due to have warm weather (for us) for the next few days, then another freezing spell. Am I wrong to dread the possibility of being caught in a blizzard here in February? Yes, it has been a weird one. I heard birds happily chirping away this morning when I walked into work. It felt like spring! Love it… but hopefully it doesn’t mean summer will be cold. We’re supposed to go below zero tonight, which is more normal for MN in January, but we have barely any snow cover. I’m concerned about the plants!